It seems that DDS-CAD (MEP) is finally being released in Australia. The entity IC3D is being rebranded as Central Innovations (website forth coming), and in doing so is hold events in Sydney and Melbourne to launch DDS-CAD. Details for the Sydney event are in the graphic below, and Melbourne event to be posted shortly (I hope). DDS is considered as one of the pioneers of Building Information Modeling (BIM). The DDS-CAD product suite supports this innovative approach to building design since its introduction. DDS was founded in 1984 in Norway. Since then DDS stands for precision, quality and innovation. Across Europe, the company is a market leader with more than 13.500 active installations of its flagship product DDS-CAD, software for Mechnical, Electrical and Plumbing design (MEP). Since November 2013, DDS operates as a subsidiary of the Munich based NEMETSCHEK AG. 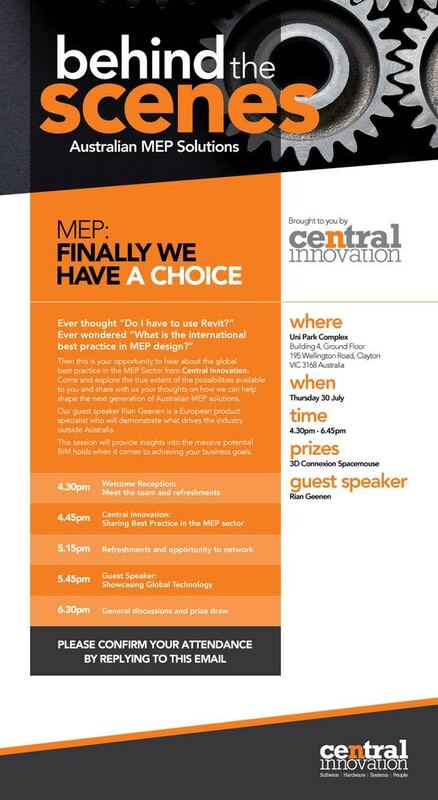 Central innovation hosts the first of a series of seminars on DDS CAD in Sydney and Melbourne next week. The events are aimed at engaging the MEP sector in a productive conversation on how we can help shape the future of Australia’s construction space. We are the parent company of both the Intercad and Graphisoft (Australia) brands.We help our customers develop their design process and systems by deploying the world’s most capable design and 3D modelling software. We enhance this with specialist consulting, ongoing training, plus access to industry focused recruitment on top of supplying the world’s fastest design oriented hardware. Whether you work on the design of manufactured products or in the construction space, we have you covered across your entire design process. Data Design System (DDS) has convinced customers worldwide with its proven CAD/BIM software for MEP project design. Regarding innovation and functionality, DDS delivers solutions for electrical, plumbing, heating, ventilation, air conditioning and photovoltaic systems. All DDS-CAD products support the Open BIM design process. To celebrate DDS-CAD’s 30 year in the industry, they re-released this footage. Really, they shouldn’t have. This entry was posted in Uncategorized on July 22, 2015 by rumbelom. Build-SA session: Documentation and Deliverables is SOLD OUT. Only a few tickets left. Last Chance. To purchase click HERE to go to our website. This next session is about delivering BIM on projects. Speakers will be presenting innovative solutions to help you work in a changing industry. The content list for the next topic is so huge we have split it across two sessions. Also the venue now shifts to the University of South Australia’s City West campus. You asked, we delivered. Feedback from the first event told us the breakout sessions were great and people want more of them. We have made the workshop sessions longer to give more time for content and discussion. And yes we are working on the coffee too….. This entry was posted in Uncategorized on July 20, 2015 by rumbelom. Following on for their sell-out third event last week, it’s great to be able to “Spotlight” the fantastic work of the MelBIM committee and supporters, most succinctly captured in the recent highlight video below. Take the time to watch the video and count the amount of BIMWallys’ making these events great. MelBIM is a not for profit group based in Melbourne, Australia that seeks to bring together the built environment community of Victoria, to share and exchange thoughts and knowledge relating to technology and innovation across the AEC+FM industry, with a particular focus on BIM. The primary vehicle for achieving our objectives is the hosting of a bi-monthly event held at RMIT, Swanston Academic Building (SAB), City Campus. MelBIM events are free to attend and include education-based presentations from industry leaders on a wide range of BIM-related subjects. Attendees of these events are provided a fantastic opportunity to network and engage with other professionals from backgrounds including Architecture, Engineering, Construction, Facility Management, Manufacturing, Planning, Quantity Surveying, Software Development/Vendors, AEC Services, Product Sales / Retail, Education and Government. This entry was posted in Uncategorized on July 7, 2015 by rumbelom. Construct15 is proud to welcome back Aconex as Silver Sponsors for 2015. 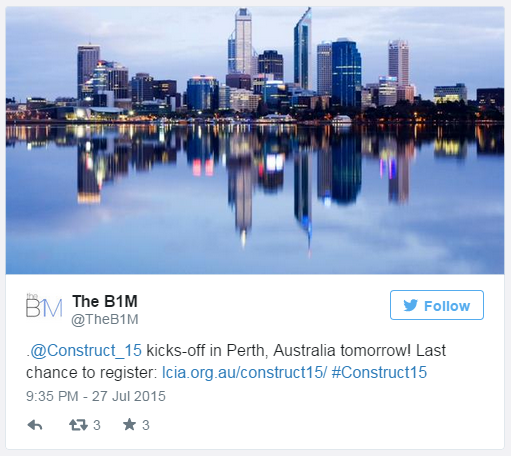 Aconex, the Australian success story now told the world over, has been a part of The BIM Day Out since the very beginning, with their co-founder Rob Philpot making the journey and speaking with attendees at the first BDO in 2013. Aconex wholeheartedly believes that BIM provides better coordination and more complete information for O&M. However, the barrier to success has been that 90% of the project team, and most project information processes, are disconnected from the model. Without the participation of all stakeholder organisations on a project, a complete audit trail of documentation and correspondence cannot be linked to the model. Enter Connect BIM from Aconex, providing project-wide, controlled access to the BIM model via the cloud. Construct15 delegates will get the opportunity to see this new, exciting solution from Aconex. Aconex provides the #1 cloud solution to manage information and processes for the world’s largest construction and engineering projects. Aconex gives owners and contractors in the construction, infrastructure, and energy and resources sectors project-wide visibility and control between the many different organizations collaborating across their projects. With more than 500,000 users and over US$1 trillion of project value delivered in 70 countries, Aconex is the industry’s most widely adopted and trusted platform. The company’s global customer base includes nine of the top ten engineering, procurement and construction (EPC/EPCM) firms, 23 of the 25 largest global design firms, and nearly all Fortune 500 construction and engineering companies. Founded in 2000, Aconex has 40 offices throughout the world, including headquarters in Melbourne, Australia and San Francisco, California. This entry was posted in Uncategorized on July 4, 2015 by rumbelom.